Jogendra (Rana Daggubati) is a financier from a village. He is very affectionate about his wife Radha (Kajal Agarwal). When Radha is mistreated by wife of a village sarpanch, Jogendra decides to teach sarpanch a lesson by contesting in elections. Slowly, situations force him become more power-hungry. He becomes an MLA and then a minister. Rest of the story is all about what happens when the relationship between Jogendra and Radha strains. Actors: Rana Daggubati is excellent as a political aspirant. There is ruthlessness and cunningness in his character and Rana portrayed it very convincingly. Kajal Agarwal has a meaty role and entire story revolves around her. She is very good. Catherine Tresa is convincing as a TV channel’s head. Posani Krishna Murali and Prabhas Seenu provide entertainment. Hima Bindu is good as sarpanch’s wife who triggers off the rise of Jogendra. Ashutosh Rana gets on your nerves as a villain. Navadeep plays a loyal lieutenant to Jogendra. Sivaji Raja is very good. Story - screenplay - direction: Teja has an unique ability to write beautiful characterizations and then extract the best from actors. Jogendra is a grey character with many negative traits. He dramatized Jogendra character in such a way that it behaves in a psychotic way at times to generate thrill and entertainment. The political ascent of Jogendra is quick and covered in first half, which is dramatic and good. The second half loses steam as it mostly focuses on the conflict between Jogendra and Radha characters. Teja who has become stereotypic in his last few films has made sure that he chooses a different subject. Other departments: Jogendra song scored by Anup Rubens is impactful. Background music is good. Cinematography by Venkat C Dileep is nice. You can see beautiful aerial shots. Dialogues written by Lakshmi Bhoopal are a big asset to the movie. There are political satires and some of them are relevant. Productions values are good. \ Analysis: First half of the film is good. Second half slows down because of two-women issue. There is honesty in climax of the movie. Plus points are Rana, characterization of Jogendra and dialogues. On the flipside, second half and villain orientation are unappealing. 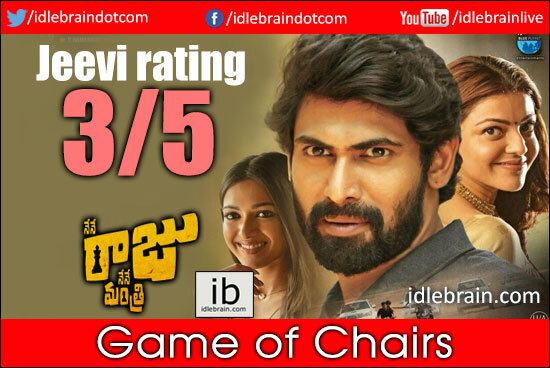 On a whole, Nene Raju Nene Mantri is a political drama that’s partly entertaining if you ignore logic.